Introductory Talk - Porous crystals: a perspective (R.M. Barrer). Plenary Lectures: Zeolites and zeolite-like materials (W.M. Meier). Exploration of the void size and structure of zeolites and molecular sieves using chemical reactions (P.A. Jacobs, J.A. Martens). Geology and Mineralogy (9 papers). Synthesis (21 papers). Ion Exchange and Modification (11 papers). Structure (14 papers). Adsorption and Diffusion (22 papers). Catalysis (44 papers). Application (9 papers). Author Index. Zeolites are attracting a great deal of attention in various fields of science and technology. Many exciting new developments have occurred in their industrial application and these developments have in turn inspired much new significant fundamental research. This proceedings volume, containing 121 contributed papers, an introductory talk, two plenary lectures and nine invited lectures, is valuable not only for the quantity but also for the high quality and originality of the contents. The topics addressed cover all fields of science and technology related to natural and synthetic zeolites, namely: mineralogy, geology, structure, synthesis, ion-exchange and modification, sorption, catalysis, and technical applications (including agricultural uses). 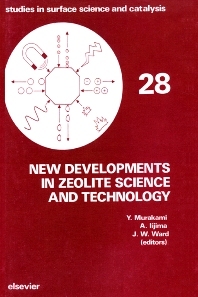 The numerous new results and concepts presented and the particularly timely publication of the volume make it a must for all involved with zeolites.